Thalassa Park Story Chair370 viewsSteve Hayter, Steve Conroy and Riley the dog enjoy the shade while sitting on 'The Magic Pudding' story chair at Thalassa Park. Thalassa Park Story Chair433 viewsThe front cover illustration of Norman Lindsay's 'The Magic Pudding' has been re-created by sculptor Steve Hayter as the backdrop of this themed park bench. Thalassa Park Story Chair329 views'The Magic Pudding' story chair was unveiled at Thalassa Park on the 2nd of November 2013 as part of the Story Book Walk. Wombat Chair426 viewsA wombat themed story telling chair. Featuring foam padding and soft fur finish. Wombat Chair309 viewsA wombat themed story telling chair. 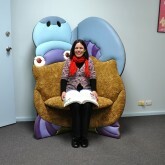 Platypus Chair412 viewsA platypus themed story telling chair. Featuring foam padding, soft fur and vinyl finish. Platypus Chair306 viewsA platypus themed story telling chair. The flat pack construction allows for easy transport.